St. Paul, Minn., December 15, 2014 PolyMet Mining Corp. (PolyMet or the Company) TSX: POM; NYSE MKT: PLM today reported that it has filed its financial results for the three and nine months ended October 31, 2014. PolyMet has executed a confidential, non-binding term sheet for a loan facility of up to US$30 million that it expects to close in early calendar 2015. PolyMet controls 100 percent of the development-stage NorthMet copper-nickel-precious metals ore-body and the nearby Erie Plant, located near Hoyt Lakes in the established mining district of the Mesabi Iron Range in northeastern Minnesota. The financial statements have been filed at www.polymetmining.com and on SEDAR and EDGAR and have been prepared in accordance with International Financial Reporting Standards (“IFRS”). All amounts are in U.S. funds. Copies can be obtained free of charge by contacting the Corporate Secretary at First Canadian Place, 100 King Street West, Suite 5700, Toronto, Ontario M5X 1C7 or by e-mail at info@polymetmining.com. Loss for the three months ended October 31, 2014 was $1.619 million compared with $1.753 million for the prior year period. General and administrative expenses excluding non-cash stock-based compensation in the three months ended October 31, 2014 were $0.997 million compared with $1.289 million in the prior year period, excluding non-cash stock based compensation. Loss for the nine months ended October 31, 2014 was $5.013 million compared with $5.175 million for the prior year period. General and administrative expenses excluding non-cash stock-based compensation in the nine months ended October 31, 2014 were $3.194 million compared with $3.695 million in the prior year period, excluding non-cash stock based compensation. At October 31, 2014 PolyMet had cash and cash equivalents of $8.866 million compared with $32.790 million at January 31, 2014. 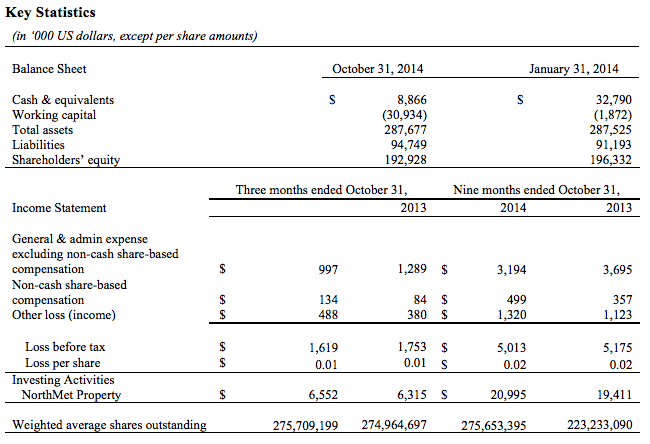 Convertible debt at October 31, 2014 was $33.073 million. PolyMet can trigger conversion of the debt to equity at a fixed price of $1.2920 per share upon receipt of permits and securing of senior construction finance. At the same time, PolyMet can trigger the early expiration of share purchase warrants held by Glencore, which, if exercised, would raise an additional $8.6 million at $1.30 per share. PolyMet invested $6.552 million into its NorthMet Project during the three months ended October 31, 2014, compared with $6.315 million in the prior year period. As of October 31, 2014 PolyMet had spent $81.732 million on environmental review and permitting, of which $75.241 million has been spent since the NorthMet Project moved from exploration to development stage. PolyMet made considerable progress in 2014. At the end of the public review period this past March, the supplemental draft Environmental Impact Statement received an EC-2 rating by the U.S. Environmental Protection Agency the highest rating the agency has given to a mine EIS, said PolyMet President and CEO Jon Cherry. Our focus today remains on completion of permitting, construction finance and project implementation. The co-lead agencies responsible for the final EIS are in their review and analysis of approximately 58,000 comments received on the supplemental draft EIS. The commissioner of the Minnesota Department of Natural Resources has stated that the co-lead agencies expect the final EIS to be completed in spring 2015. Completion of the final EIS, incorporating appropriate responses to public comments, and a subsequent adequacy decision by the MDNR and Record of Decision by the federal agencies are necessary before the land exchange can occur and various permits required to construct and operate the NorthMet Project can be issued. The EIS process and permitting are not controlled by PolyMet, but the Company anticipates permits issued as early as late calendar 2015. PolyMet plans to complete a Definitive Cost Estimate and Project Update in the next several months, which will incorporate numerous process and project improvements, environmental controls described in the supplemental draft EIS and subsequent changes that will be reflected in the final EIS. The Project Update, to be filed under Canadian National Instrument 43-101, will be based on the project implementation plan and include detailed capital and operating costs reflecting the advance stage of engineering and design. It will also form the basis for securing construction finance so that construction can start promptly upon receipt of key permits. Joe Scipioni has transitioned from chief operating officer to a consulting role for PolyMet under a multi-year agreement in which he will continue to advise the company. Mr. Scipioni joined PolyMet in July 2006 and has served in different capacities including as president and CEO from 2008 until July 2012. We thank Joe for his many contributions, Cherry said. His experience and involvement on the Iron Range have been invaluable and we look forward to his continued advice and assistance as the project advances through completion of permitting, financing and implementation. Mr. Scipionis day-to-day responsibilities have been assumed by the management team. PolyMet Mining Corp. (www.polymetmining.com) is a publicly-traded mine development company that owns 100 percent of Poly Met Mining, Inc., a Minnesota corporation that controls 100 percent of the NorthMet copper-nickel-precious metals ore body through a long-term lease and owns 100 percent of the Erie Plant, a large processing facility located approximately six miles from the ore body in the established mining district of the Mesabi Range in northeastern Minnesota. Poly Met Mining, Inc. has completed its Definitive Feasibility Study and is seeking environmental and operating permits to enable it to commence production. The NorthMet Project is expected to require approximately two million hours of construction labor, creating approximately 360 long-term jobs, a level of activity that will have a significant multiplier effect in the local economy. This news release contains certain forward-looking statements concerning anticipated developments in PolyMet’s operations in the future. Forward-looking statements are frequently, but not always, identified by words such as expects, anticipates, believes, intends, estimates, potential, possible, projects, plans, and similar expressions, or statements that events, conditions or results will, may, could, or should occur or be achieved or their negatives or other comparable words. These forward-looking statements may include statements regarding the ability to receive environmental and operating permits, job creation, or other statements that are not a statement of fact. Forward-looking statements address future events and conditions and therefore involve inherent known and unknown risks and uncertainties. Actual results may differ materially from those in the forward-looking statements due to risks facing PolyMet or due to actual facts differing from the assumptions underlying its predictions. Specific reference is made to PolyMet’s most recent Annual Report on Form 20-F for the fiscal year ended January 31, 2014 and in our other filings with Canadian securities authorities and the U.S. Securities and Exchange Commission, including our Report on Form 6-K providing information with respect to our operations for the three months ended April 30, 2014 for a discussion of some of the risk factors and other considerations underlying forward-looking statements.